– Evil plans with phases! 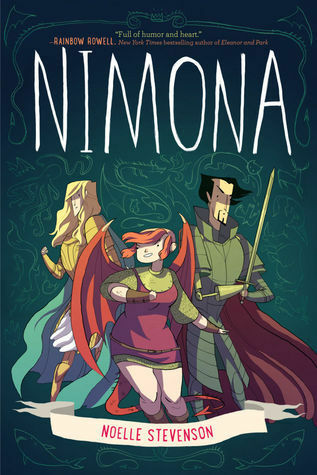 Nimona is about a shapeshifting bad-arse woman that convinces the villainous Lord Ballister Blackheart to allow her to be his new sidekick. A number of really fun encounters take place and I was so happy to go along for the ride. The humour is exactly the type that I like – very silly and random but quite clever at the same time. Just like me, right?! Right?? RIGHT! And it’s not just written humour, little things like having a control deck with buttons and the such but also having a quill on the worktop because let’s not forget that we are in the middle ages. At times it almost feels fourth wall breaking and that it’s poking fun at the whole genre, but in a sincere lovable way. The book is a real page turner. The story builds to a crescendo of fast paced excitement that leaves with a very satisfying bittersweet ending. I really wanted to take shots of almost every other panel and share it, but that would be illegal. So, instead, go ahead and just buy and read the book. You will not be disappointed. Anyway, I’m off to go make some evil plans and then section them into phases. Phases! I thought this word has forever been ruined for me, but perhaps if I read Nimona, it will resurrect!